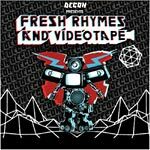 Fresh Rhymes and Videotape is part of a new series of audio/visual centric releases from Decon Records. Scheduled to be both digital and physical projects, Volume 1 features brand new tracks with conceptual video integration from some well established artists and producers in underground hip hop and beyond. Featuring Dilated Peoples, The Alchemist, Aceyalone, 88-Keys and Mars Whiteman. The DVD portion contains an hour of live performances and behind the scenes footage of the Fresh Rhymes And Videotape tour!